Abstract: Hearing loss is the most common birth anomaly, and diagnosis and habilitation account for a significant financial burden. Although diagnosis and treatment have evolved, significant technological challenges remain. 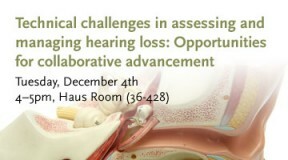 This lecture will review the anatomy and physiology of hearing, types of hearing loss, and specific areas of technological deficit in our current ability to diagnose and treat hearing loss. There will be an emphasis on opportunities for scientific and technological advances to directly impact patient care in the arena of translational research. Robert C. O’Reilly, MD is the Division Chief of Pediatric Otolaryngology and Director of the Pediatric Balance and Vestibular Disorders Laboratory at the Nemours Alfred I. duPont Hospital for Children and Nemours Biomedical Research Department. He is a Clinical Associate Professor of Pediatrics and Otolaryngology at Thomas Jefferson University and a full-time pediatric Neurotologic surgeon at Nemours Alfred I. duPont Hospital for Children. Dr. O’Reilly’s current research includes assessment of balance dysfunction in pediatric patients with Chiari Type I malformation, assessment of static and dynamic balance in pediatric vestibulopathy, the role of gastroesophageal reflux disease in otitis media, ophthalmic disorders in genetic hearing loss, and techniques of prevention of pediatric ototoxicity. Dr. O’Reilly’s basic science and research publications have included techniques of otologic surgery and disorders of the cochlea and vestibular systems. He has presented his work at national and international meetings and currently holds appointed positions for several of the major journals in his specialty. Thierry Morlet, Ph.D. is the Head of the Auditory Physiology and Psychoacoutics Laboratory at Nemours/Alfred I. DuPont Hospital for Children (Wilmington, DE). The fundamental studies at the Auditory Physiology and Psychoacoustics Laboratory involve research on the development of cochlear mechanisms and afferent and efferent auditory pathways. Clinical implications include diagnosis and management of children with Auditory Processing Disorders, children presenting with Auditory Neuropathy Spectrum Disorder, and of children with various inner ear. Dr. Morlet earned his Ph.D. in the neuroscience program at the University of Lyon in France in 1997. He is a neuroscientist whose area of expertise is human auditory physiology, and has extensively studied otoacoustic emissions and the efferent auditory pathways in the normally functioning and diseased auditory systems of children and adults. He has authored or coauthored more than 40 articles.